With me having most of last week off, my plan was to blog as much as possible to make up for the once a week posts I’ve been scrapping together lately. I have an actual queue of posts that have yet to be written, are half done, photos taken and finished in my head. But that doesn’t add up to anything when it isn’t posted. As I was settling down to write and organize my thoughts, my computer dies. Specifically the hard drive gives up the ghost. More than three hours was spent trying to retrieve data from the dead hard drive. Another day was lost importing the data to my new computer. So come Sunday night, all I have to show for my efforts is a photo of my new computer. But it’s a lovely computer all the same. I love it lots and lots. Only if it would write all my posts for me. Now that would be something. 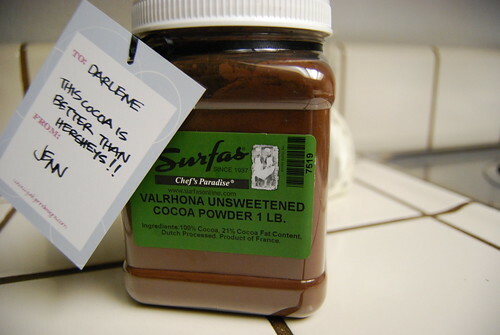 In other news, a great thanks to my thoughtful blogger buddy for the large canister of Valrhona cocoa mailed to me to specifically replace the container of Hershey’s in my cupboard. I predict I will be doing a lot of baking in the future sans that alkaline poison. 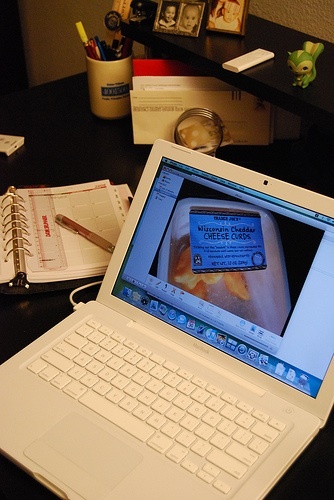 It seems like this photo generated a lot of responses and criticism of my pantry but it’s all real, good or bad. DAHAHA! How rude for someone to be so critical of your….oops. My bad. Hey Jenn. Nah! Don't worry about it. I was actually surprised no one really slammed the Spam and the fact it was Lite Spam. "Like dude, why are you still eating Spam when you're a fat pig?" I got free food in the end. That's a good thing.